The Kenai Peninsula is home to the Kenai River and the scenic town of Homer. For over two decades, Chuck Thomas Sportfishing has been guiding here - Customize your fishing package to include as many king salmon and halibut fishing days as you like or add a fly-out day to the mix. 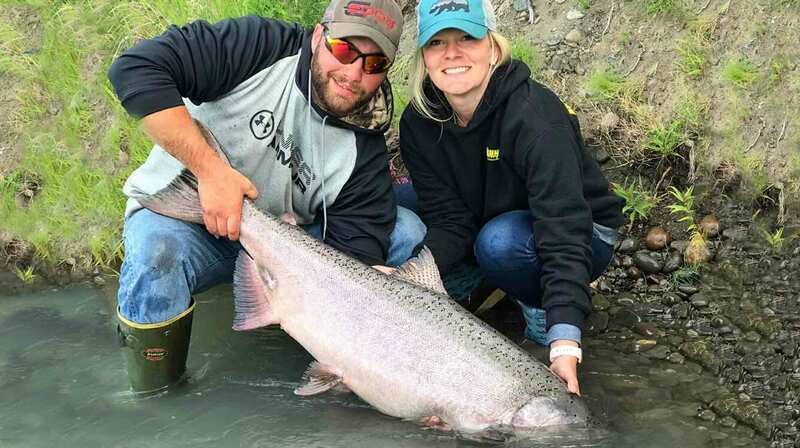 The Kenai River is known for its world record salmon runs. Kings average 30 to 40-pounds with numerous 60- to 70-pound kings landed each year. The Kenai has two runs of king salmon. The first one lasts until the end of June, and the second run usually ends around July 31st. Silver salmon: The Kenai also has two runs of silver salmon. The Kenai’s silver run is underway by the first week of August. Sockeye salmon hit the Kenai in mid-July and run through the second week of August. Kenai sockeye average 4 to 10-pounds. Sockeye is considered, by some, to be the best-tasting salmon. You can also arrange to fish the Kasilof River, a small river known for its numbers of king salmon that return each year to spawn. The Kasilof is a drift-boat-only river with a good run of silvers, beginning in August. Each package has at least one day of halibut fishing. Several options are available - customize your package. Book a day trip to Cook Inlet for halibut fishing. Fish for Pacific halibut averaging 18- to 22-pounds (chicken-sized halibut are the best eating), and barndoor-sized-halibut, weighing up to 400-pounds. During the minus tides, you can also dig for tasty razor clams. All ages and skill levels are welcome. Season: runs from May through September. Guided hours: Trips are 6 to 8-hours. Salmon charters start at 6:00 a.m. and Halibut charters at 7:00 a.m. Boats for river fishing: 20-foot open jet sleds are limited to a maximum of four anglers and a guide. Halibut charters: Each package includes one-day halibut fishing aboard a 32' Saltwater cruisers with covered cabins. The boats seat up to six anglers plus Captain and deckhand. Guides: are career professionals, each averaging over twenty years of fishing experience in Alaska and the Pacific Northwest. Equipment: Fishing gear, tackle, and all the bait needed for your trip are provided. Fishing License: Your fishing license and king stamp are not included in the package. Lunch: You'll need to bring your own lunch, snacks, and beverages for the boat. A cooler and ice chest are provided on the boats. Ground transportation: You will need to rent a car as no transportation is provided. The drive to the Kenai is 2.5 hours from Anchorage, or ten minutes if you fly to the Kenai airport. 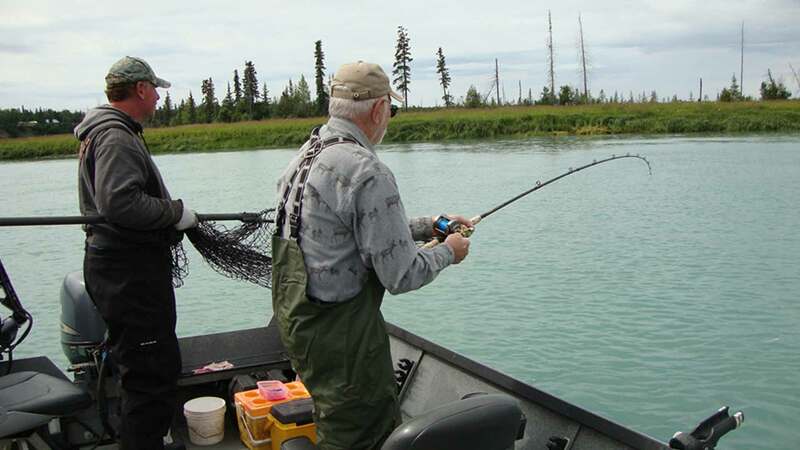 On Kenai fishing days, you'll have about a 10-minute drive to the river. On your halibut fishing day, you'll have at least a 90-minute drive from Soldotna to Cook Inlet. From Anchorage to Cook Inlet is a 3.5-hour drive. Anchorage to Homer is a 4-hour drive. Lodging: You'll stay in Soldotna, Alaska. Lodging options vary from a cabin that comfortably sleeps a group of six to a private condominium for smaller groups. All lodging is double occupancy. Meals: No meals are provided. You’ll prepare or purchase your own meals. There is a Fred Meyer, a Safeway, and a Walmart nearby. There is also a wide choice of restaurants available. Chuck Thomas's is the option for anglers who want the expertise of a guide service during the day and no set agenda in the evening. After a day's fishing, if you still want to get a little more fishing in, you can head over to the Soldotna River Walk for some sockeye fishing. The evening is yours. There are several options for getting here. You can fly to Anchorage—the Ted Stevens Anchorage International Airport. You'll need to rent a vehicle, and drive the scenic Seward Highway to Soldotna, Alaska, a two-and-a-half-hour drive. Alternatively, you may fly from Anchorage to the Kenai Municipal Airport, a 20-minute flight, and rent a vehicle and drive 10-minutes to Soldotna. Create a custom package – flexible trip options are available. Fly-out day trips can be arranged for an extra fee. 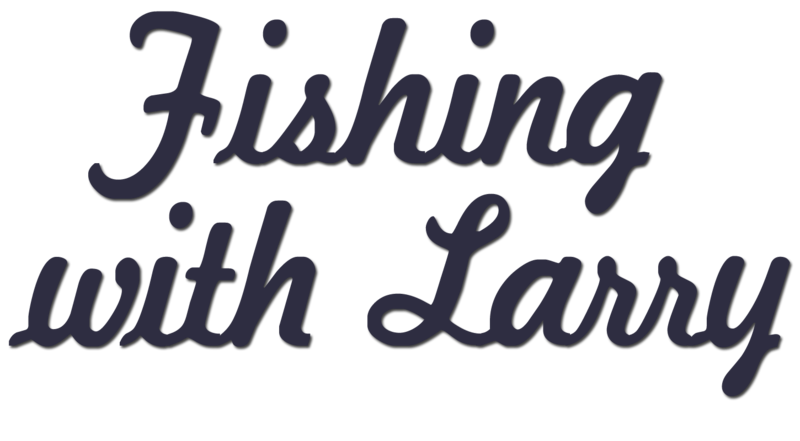 Double-occupancy lodging, guided fishing, use of gear and tackle, all bait needed for your trip, and complimentary fish processing (filleting, vacuum packing, freezing, and boxing in airline-approved boxes). Airfare, meals, alcohol, taxes, fly-outs, fishing license, a King Salmon Stamp, gratuities, Global Rescue, Signature Travel Insurance, and anything not covered under inclusions. 50% of the total is due upon reservation. Final payment is due ninety days prior to arrival. Reservations made less than sixty days prior to arrival must be paid in full. Cancellations made 90-days prior to arrival, receive a full refund less 10% service fee. Cancellations made 60-days prior to arrival, receive a 50% refund. Cancellations made 30-days prior to arrival, receive a 25% refund and any cancellation made less than 30-days prior to arrival is nonrefundable. Cell phones work well in this area and can be used as a hotspot to access the internet. There are also many local businesses that have free Wi-Fi, including McDonald’s, Safeway, and the local coffee shop. Kenai king salmon fishing and charter fishing, too.